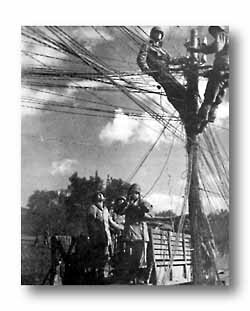 WIREMEN getting communications installed. The farm yard is a good place. Hay insures comfortable bed. 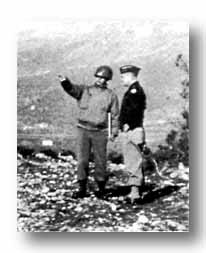 General Dwight D. Eisenhower, Commanding the Allied Forces in the Mediterranean, came to look over the Liri Valley after the fall of San Pietro. 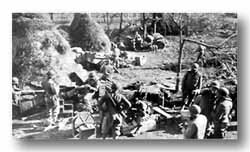 From a vantage point, General Walker points toward Cassino and the hills the Germans are defending ahead. Shortly thereafter, General Eisenhower was appointed Supreme Allied Commander in preparation for the invasion of Northern France. 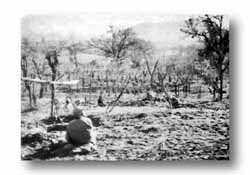 DOUGHBOYS, digging fighting holes in an Italian vineyard, pause to watch intently as unidentified planes come into view. 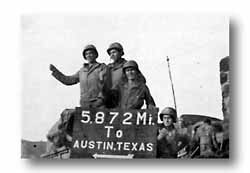 THINKING OF HOME, four 36th QM men figured out the mileage to Austin by way of Rome and Berlin. Left to right: Pvt. Clint G. Sedberry, Cpl. Melvin A. Cox, Cpl. Sam M. Douglas, and Cpl. Morris D. Wallis. Wiremen from Battalion, Regiment, and Division shared with infantrymen the hardships of the bitter winter campaign. They worked untiringly over long periods to insure the best possible communication. Roadless mountains had to be crossed with wire, streams had to be forded and the elements endured. Lines that took hours to lay would suddenly be severed by enemy artillery. These had to be repaired in the pitch-black of night, or under observation during the day.